SMALL AND PERFECTLY FORMED. Each planter pot measures 3.2" diameter X 3" tall, and features a drainage hole and bamboo tray - plant not included. GREAT FOR HOME DECOR. Modern minimalist design and its clean lines are greatly suitable for decorating your windowsill, desktop, kitchen, bathroom, office and bedroom. 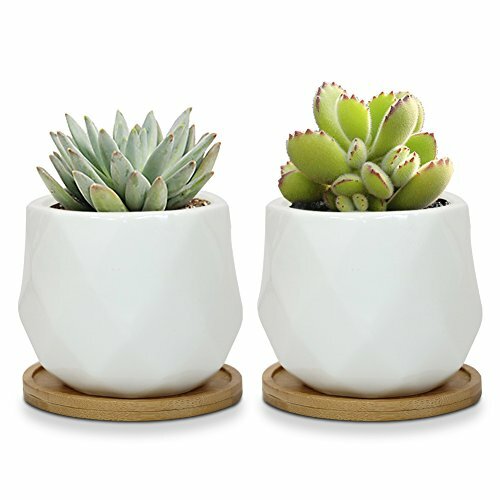 PERFECTLY DISPLAYS LIVE POTTED PLANTS.Modern white planters set perfect for succulent or fake succulent,small cactus,herb and flower,no concerns to put indoor or outdoor. If any assistance needed,please feel free to contact us by clicking our shop name Sqowl,then click the "ask a question" button. If you have any questions about this product by Sqowl, contact us by completing and submitting the form below. If you are looking for a specif part number, please include it with your message.